SEASON'S READINGS! To celebrate the holidays and the launch of GUILTY AS CINNAMON, the second Spice Shop Mysteries, next week, I'm offering TWO signed copies! Leave a comment below for a chance to win. Lordy, what a year it’s been! I tell you. First, we get a new boss—Pepper’s a doll but don’t tell her I said so; I’ve got a reputation to protect. Then she sets about “rebranding” the Spice Shop, a fancy word for getting new stationery and business cards. Well, that logo—an old-fashioned glass salt shaker sprinkling salt onto the waves—is just about the cutest thing ever. And Pepper herself came up with it, not that annoying graphic designer who’s all about “hip!” and “modern!” and “new!” As if a big part of the Pike Place Market’s appeal isn’t its history and traditions. Pepper, bless her, manages to balance them both. But don’t tell her I said so. And then, a body on our doorstep. I like to died; I almost did, when they took our girl away in handcuffs. Handcuffs, for that sweet thing. Okay, I could smack her for shutting us out and keeping too many secrets, but I understand why. And Pepper. Well, she rose to that occasion like bread in a hot oven. I never would have thought she would find the killer before the police did and bring our girl home in time to---well, I won't spill that secret, if you don't already know. But sure enough. Pepper was loyalty and brilliance personified. There is one tiny thing I fault her for. I know, hiring is a—well, it rhymes with witch, but don’t tell her.... I suppose she didn’t have much choice, and some women are good at fooling people. That one sure did. If you press me, I’d have to admit, she fooled me, too—for about five minutes. But she’s gone now, thank goodness. 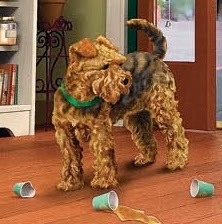 All that happened afterwards—well, you’ll just have to read GUILTY AS CINNAMON for the whole story. Pepper handled it all beautifully. And you can tell her I said so. Readers, as the Spice Shop readies for Christmas, I’m celebrating the launch of a new book, GUILTY AS CINNAMON, by offering TWO signed copies. Leave a comment to be entered -- PLEASE include your email address! Ruff the Cat will count your entry twice if you tell us something you’re looking forward to this holiday season! Contest open till midnight Saturday, November 28. Leslie Budewitz is the author of the Food Lovers’ Village Mysteries and the Spice Shop Mysteries—and the first author to win Agatha Awards for both fiction and nonfiction. She fell in love with the Pike Place Market as a college student in Seattle, and still makes regular pilgrimages. The president of Sisters in Crime, she lives in northwest Montana with her husband, a musician and doctor of natural medicine, and their cat Ruff, a cover model and avid bird-watcher. 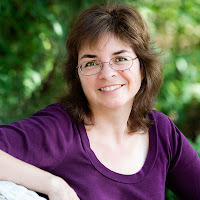 Connect with her on her website or on Facebook. sounds like a good story. I'm looking forward to seeing relatives from out of town. Thank you for the giveaway. I am looking forward to seeing the Christmas decorations. Thanks for teh chance! I am looking forward to sharing presents. I got some amazing things this year. Have not had the pleasure of reading this author. Have read the blurbs for this book and two others and they all look like fun reads. So Jan at the book store has added some more books to the tbr list. This year I am looking forward to re-connecting with some friends I have not seen in ages. Thank goodness they are the forgiving sort. Because I am terrible about keeping in touch. That's the magic of the season, Della! Enjoy! I'm eagerly awaiting this book! My family is scattered so I'm looking forward to phone calls from across the country. Looking forward to the Christmas lights in my back yard. I can see them from the kitchen and dining room. Thanks for the giveaway! 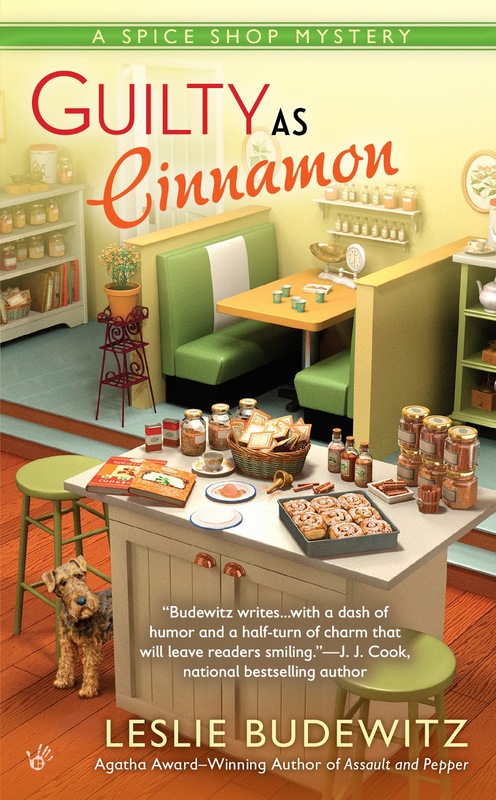 "Guilty as Cinnamon" sounds wonderful. I am looking forward to seeing the Christmas decorations and light displays. Thank you for this chance. I can't wait to read this. I loved the first book in the series and can't wait to read this one too. Thank you for the chance to win this. I would love to win this book. Love reading books with recipes in them. So many lovely comments -- I wish blogger had a "like" feature. I'll be traveling today and may not get a chance to check back in with you until this evening, so keep 'em coming! Wow -- that's impressive! I feel lucky if my Christmas cactus blooms -- as it is about to do! I'm looking forward to reading this. Thanks for the chance! I'm also looking forward to seeing family this Christmas! Thanks for the chance to win! I have the first one and thoroughly enjoyed it so anxiously awaiting this one. I'm looking forward to seeing all the Christmas lights glowing in the dark as I drive through town. Oh, double points for a spice pun, Libby! I'm looking foward to driving around and looking at all of the Christmas lights. I am looking forward to seeing all the beautiful lights, thanks for the giveaway! Would really like to read this book. I'm looking forward to spending time with family and friends this holiday season. Thanks for a chance to win this book. I haven't read this series yet, but hope to soon. I love to see all the Christmas decorations in my neighborhood. And I like to make homemade Christmas presents for my family and friends. I loved the first book in this new series. I can't wait to read this latest book in the series. I love series books. It gives me time to really get acquainted with the characters. I am looking forward to having my grandchildren around this holiday season. They recently moved in beside me so it should be lots of fun. I love seasonal books and especially when they are cozy mysteries. Thanks for the review/interview. Looking forward to spending time with family and friends. Happy Holidays to you and yours! Thanks for the chance! I am looking forward to my BFF coming into town around Christmas, as well as one of my nieces! Thank you ALL for the wonderful comments! Checking in briefly, then headed back for another visit with my mother! Gosh, yes -- there are some darling outfits for the little ones, girls and boys. Happy shopping! I am looking forward to snow! Snow, snow, snow! We have had only a dusting so far. And I am looking forward to listening to Christmas music! Now that IS a week to look forward to! A lovely way to put it, Heather. This world is much in need of that reminder these days. Ohhh, this sounds like such an interesting mystery. How wonderful it would be to have it to read during the slower time between Christmas & New Year's. I always look forward to that quiet time by the tree with all the business of the holidays slowing down. I love Leslie Budewitz's books! Every single one of them, I would be very, very pleased to win this one. Thank you so much for the chance! I am looking forward to catching up with all of my family. Look forward to reading more spice shop mysteries. I always look forword to the chance to just relax and enjoy the Holidays with friends and family. Gosh I love Christmas and the cool weather, all the lights and smells that go on...I am looking forward to a an old College Roommate coming down and the usual family fun. The Book sounds wonderful and I have it on my list for a later thyme...pun...thanks for the contest. Ooh this looks good! Thanks for the giveaway. I'm looking forward to my grandson opening his gifts and getting together with family. Thank you for the giveaway! We are cutting waaay back on the sheer number and dollars spent on gifts this year. I am hoping we will appreciate each other more. Thank you for the giveaway. I am looking forward to all the special food that is only made during the holiday. Love going to listen to the church choir sing Christmas songs. The smell of the Christmas tree and the mulled spiced cider, love it all, looking forward to it. Would be a plus to win this book. Sounds like a great read. Thank you for the chance to win. I'm looking forward to spending time with my three grandkids. I'm looking forward to having the grandkids here for Christmas. Don't get to see them as much as I would like. The book sounds good. I always say you can't have too many books but don't tell my DH I said so. He thinks I have enough books. Thanks for the chance to win this book. It sounds great. I am looking forward to Christmas to be spending time with my kids and grandkids. I just love being with them all. Love the Holiday Season, Looking forward to spending time with the family. Happy Holidays Everyone!!! Love the Holiday season the best part is spending time with the family . Happy Holidays . Baking and decorating gingerbread houses with my grandchildren! It's a tradition we started 3 years ago and we all have a wonderful time. Thank you! This sounds like such a fun read! I am looking forward to seeing Christmas through the eyes of my 20 month old granddaughter. Thanks for this giveaway. I'm looking forward to seeing "Star Wars: The Force Awakens". Sounds yummy ;) I know I've missed it but I wanted to share... I most look forward to having all 8 of my children home in our teeny-tiny house! All the noise, all the craziness, all the FUN!! Merry Christmas! Fun giveaway! Looking forward to Christmas because my great nephew is two and old enough to be excited about it. He was so darned cute while helping my sister decorate the tree. Of course, he hung everything in the same place, which added to the adult enjoyment. I am anxious to read "Guilty as Find". Did you know that it is a good spice for helping to be healthy. My favorite part of Christmas is going home to spend time with my family. 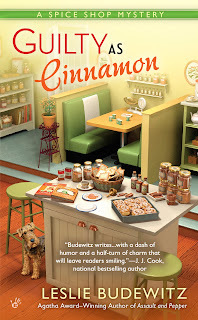 Congratulations to Lynne Wesenberg and Marcy Maddox, winners of GUILTY AS CINNAMON! Thank you all for sharing your memories-in-the-making!